Frederick John Horniman, Victorian tea trader and philanthropist, began collecting objects, specimens and artefacts 'illustrating natural history and the arts and handicrafts of various peoples of the world' from around 1860. His overarching mission was to 'bring the world to Forest Hill' and educate and enrich the lives of the local community. His travels took him to far flung destinations such as Egypt, Sri Lanka, Burma, China, Japan, Canada and the United States collecting objects which 'either appealed to his own fancy or that seemed to him likely to interest and inform those who had not had the opportunity to visit distant lands'. Mr Horniman’s interest as a collector was well known and many travellers approached him with specimens and curiosities. By the late nineteenth century, these 'natural, industrial and artistic spoils had accumulated to such an extent that he gave up the whole house to the collections'. His wife is reported to have said 'either the collection goes or we do'. With that, the family moved to Surrey Mount the grounds of which adjoined those of the former residence. The Horniman family's former London Road residence became known as the Surrey House Museum and was freely opened to the general public on 24 December 1890. The museum was initially open every Wednesday and Saturday from 2pm until 9pm and on bank holidays from 10am to 9pm. Arrangements were made for the reception of schools, societies and clubs and every visitor was supplied with a free hand guide catalogue to help them examine and interpret the objects on display. The collection was divided into two sections - Art and Nature. During its first year, the museum was open for 110 days and received 42,808 visitors. Mr Horniman and his staff including the museum's first curator Richard Quick continued to actively develop the collections with regards to both display and content. In 1893, it was necessary to build an extension onto the museum to accommodate the growing collection. The adjoining gardens were officially opened to the public on 1 June 1895. In 1898, Mr Horniman decided to erect a more suitable public museum in which the collections could be adequately displayed and appreciated. The old museum was closed on 29 January 1898 and demolished in the May of that year. Surrey Mount was used as a store house. The architect Charles Harrison Townsend was commissioned to design the new museum. The foundations were laid between June and September 1898. When the building was completed, in his determination to increase the popularity and utility of the museum, particularly with regards to learning and education, Mr Horniman resolved to donate the museum, collections and adjoining grounds as a free gift to the people in perpetuity with London County Council as Trustees. The Museum and Gardens were formally opened to the public on 29 June 1901. The Horniman family continued to take an active interest in the museum donating objects and large collections of books to the library. In 1912, Frederick Horniman's son Emslie Horniman generously donated money to build a new library and lecture theatre. 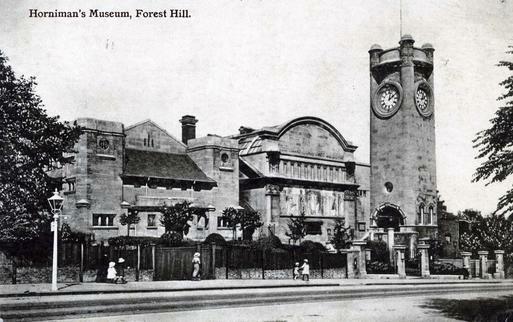 Under the London County Council and its various adaptations, the museum continued to develop collections and learning and education programmes that 'brought the world to Forest Hill'. The Museum's founder, Frederick John Horniman (1835-1906) was chairman and managing director of the Horniman Tea Company. Frederick Horniman was the son of John Horniman (1803-1892) who first established the Horniman Tea Company in the Isle of Wight. They were the first tea manufacurers to sell tea in machine-sealed packets. In 1859, Frederick Horniman married his first wife, Rebekah Emslie (1825-1895) and they went on to have two children, a daughter Annie and a son Emslie. Frederick Horniman married his second wife Minnie Louise Bennett (d.1964) in 1897 and they had two children, Minnifred and Erica. Frederick Horniman's daughter from his first marriage, Annie Horniman (1860-1937), was a pioneer of the repertory theatre movement. She was particularly associated with the Abbey Theatre in Dublin and the Gaiety Theatre in Manchester. Annie's brother Emslie Horniman (1863-1932) supervised the donation of the Museum to the London County Council in 1901. He was also responsible for the Emslie Horniman Pleasance, the park where the Notting Hill Carnival has normally started. In 1886, Emslie Horniman married Laura Isobel Plomer (d. 1942) and they had three children: (Laurence) Ivan, Olivia Emslie, and (John) Eric. Emslie Horniman died at his home, Garden Corner in London's Chelsea Embankment, SW3. Emslie's son Eric Horniman accompanied the distinguished anthropologist and ethnologist Alfred Cort Haddon on his American expedition. Eric donated North American material to the Museum in 1913, possibly gathered during this trip. Emslie's oldest son Ivan Horniman served on the Museum's Advisory Committee and retired in 1960. Ivan Horniman's son, Michael Horniman, has acted as a Trustee of the Museum.